I forgot how easy it is to make homemade pickles. It was a lot easier than putting together that jig saw puzzle they’re sitting on. The pickles took 5 minutes. The puzzle? Three months! These are bread & butter pickles, which are also called refrigerator pickles, and now is a good time to make them. Cucumbers are at their best during summer and it’s the Kirby cucumber (not the Persian one) that is best for pickles. I sliced the cuces super thin this time and they are so soft they bend but they’re still crispy, probably because I left the skin on. If you peel the cucumbers, the pickles are a lot softer. I also put more sugar in this time and I found I like the pickles a little sweeter. So I added a note to the recipe that you can use more sugar if you like sweeter pickles. Don’t be freaked out by the amount of sugar: it’s 1/2 to 3/4 of a cup because remember, the sugar mostly stays in the water. 7 Comments on "I made pickles"
These pickles are made with a very basic brine of equal parts cider vinegar and water mixed with salt. 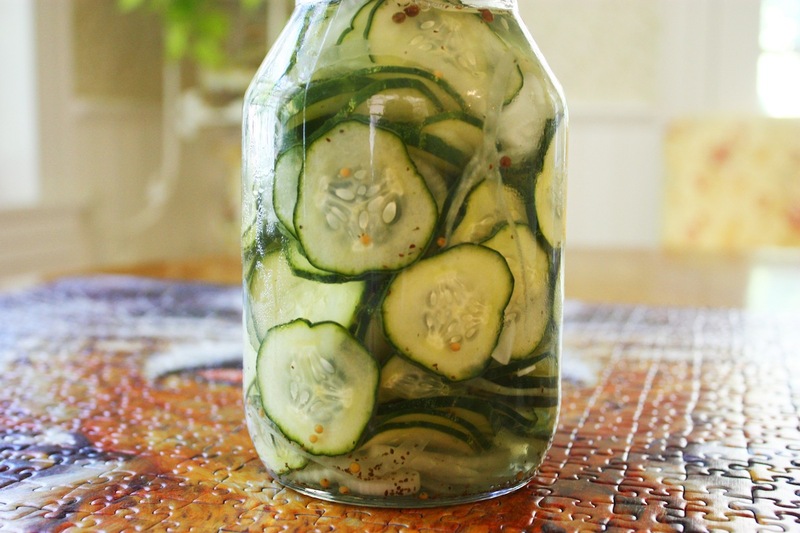 This brine gets poured over the cucumbers — whole cukes, spears, or sliced coins — and transforms the vegetables into pickles. By the way I used to have the most fun neighbor who lived next door. We exchanged recipes , good times, and borrowed from each other nearly every time we cooked..which was every day as we both had big families, I guess I am wishing you were my next door neighbor! I have your no knead whole wheat bread mixed and sitting on the counter until tomorrow. I came to see if you had any new recipes and there were your yummy looking pickles. I plan to make them soon. I ordered your book and I love this site and can’t quit watching all the videos. Cooking should always be fun and easy the way you present it! Thanks for all the time you have put into sharing these great recipes . Thanks but my cookbook is free as a download here on this website. Oh well, missed that. Hope you receive a little from my purchase. I think I did see the download but thought this was different. I never took any money from the book. I signed for all my profits to go to City of Hope for breast cancer research. I don’t sell anything and I share all my recipes for free, including the cookbook.